Drum roll, please …. 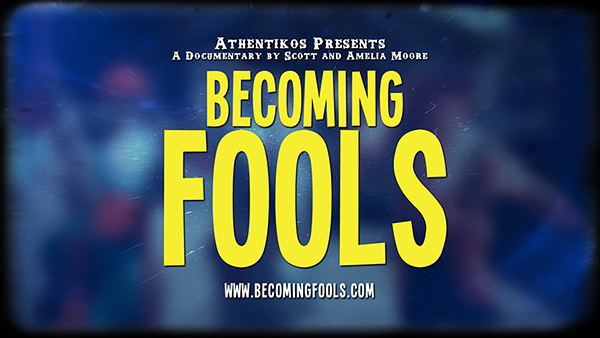 After much anticipation, we are thrilled to release the official Becoming Fools Movie Trailer. We’re not yet finished with the film, but we’re close. It’s in the final phase of post-production: coloring, music, mixing, animation, art, and credits. After a year of pre-production and research, 6 months of production and 6 months of editing and post-production, we are rounding the turn towards the finish line. My heart has swung through all emotions imaginable over the course of this journey – from loving the story, to absolutely hating it, to loving it again. The production phase is my favorite. It is a time when we are out in the world together, collaborating, capturing a story and experiencing the richness of community. It’s hard work, but somehow we don’t notice because we are together. You should hear the laughter at 2 AM when we’re logging footage, after a 12 hour shoot in a dirty environment … and the water is off, so you can’t take a shower before bed. It is a true joy! Then there is the flip side. If production is a joy because of community, then editing is the Alcatraz prison of loneliness. To be honest, I often wrestle with depression while editing a film. It is a long period of isolation in the “editing cave” with only small spurts of community when we evaluate the film. And because those small doses of community are focused on critically evaluating the film, it usually results in me having to spend more time editing in isolation. Don’t get me wrong. I greatly value constructive criticism during the process and want our films to be the best they can be! It just begins to take its toll after 6 months of 16 hour work days. Needless to say, I am very glad that I can see the light at the end of the editing tunnel! After all this work, the film is slightly different than we originally imagined. But, this is normal because you never have control over all the production elements in a documentary. In this case, we were thrown some pretty big wild cards during production. I compared it to riding a wild bull. We just held on tight, kept the cameras rolling, and prayed we were capturing what we needed to tell a great story. Thankfully, we captured some great stuff! During a recent Athentikos meeting, we engaged in a deep and honest discussion about the film. We asked some tough questions …. Is this a compelling story? Does this film achieve what we set out to do? Is the story depicted in the final edit the same story we passionately felt called to produce in the beginning? It was unanimous. Even though the story is different than we initially imagined, it compellingly accomplishes the goal we set out to achieve. This is the story God called us to tell. It’s full of warm characters, beautiful tension and redemption that we couldn’t have written better if we wrote it as a narrative. It still makes me cry … and I have seen it thousands of times over the course of editing! So, either I am completely off my rocker, or this story truly connects to the heart. As we work diligently to wrap up the final details in this project, I have mixed emotions. I’ve committed 2 years of my life to developing, filming and editing this story. I’ve grown to love these street youth as dear friends. Their delicate charm has captured my heart! I would love for this film to raise awareness and bring needed resources to this issue! But, I have no idea what will become of it all. We raised enough funding to get through production. But we still lack the financial resources to release the film. Unfortunately, we can’t subsidize this next phase with our sweat equity. Unless we receive additional funding, we will be forced to put the film on hold. We truly believe this story has the potential to make a difference in the lives of street youth around the world. But we need your help … will you consider giving a donation? As of right now, we only have one official film screening planned. Let’s make it count! Becoming Fools will screen at the Omaha Film Festival on Sunday March 10 at 12:15 PM. Gather your friends and meet us there! If you are too far away to attend, please help us make noise so we can try to fill the theater. Use every means necessary to tell people about this opportunity to see the film: Facebook, Twitter, Instagram, phone calls, post cards, smoke signal … and especially talking face to face! Please watch the trailer and share it. Give a donation if you can. Work with us to help bring the film to your city. Let’s become fools together and make a difference! Give a tax-deductible donation to help us release the film.